Everything from Alice’s physical changes to the discomfort she feels in the presence of the Duchess represent the inevitable movement from childhood to the lost innocence of adulthood. Alice begins as a cool and rational girl, but all of her sense of order is shaken as she encounters characters and situations which defy her sense of order in the world. 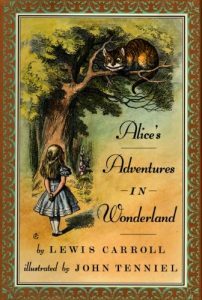 In order to make it through Wonderland, Alice must rely on cunning and even manipulation in order to succeed. For example, the Queen of Hearts makes little sense yet her authority holds no matter how ridiculous it is. Adult life is full of these injustices. All of this serves to dramatize the way one’s sense of familiarity and innocence is upended as we move into adulthood. The belief that the world is safe and stable is lost, and one must adjust to things that are unjust and do not make sense. Throughout the story, Alice encounters situations which make little sense. Even when she is given information meant to help her, this information proves to be just as nonsensical. The croquet match is a perfect example. The game itself is simple and follows hard and fast rules. But when Alice attempts to play with the Queen of Hearts, the mallets are made of flamingos and hedgehogs. This dramatizes the way our best efforts at making the world orderly are often frustrated by events and situations which simply do not make sense or are unfair. Alice learns that life itself does not play by the rules, and she must learn to negotiate the world without any of her pre-established ideas of order. Many of Alice’s adventures are actually mortally dangerous. Since everything first appears as stock story-book images, rabbits and magical queens, the menace of death becomes thinly hidden. Alice’s first encounters with many of the creatures in Wonderland are fairly simple, but they quickly become dangerous. The story seems to imply that death may lurk behind the most benign things, that even the most ordinary situation could prove to be deadly serious.